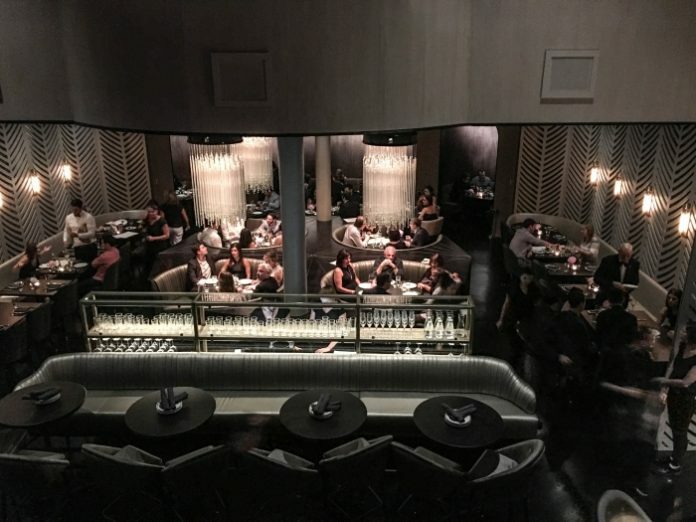 One of the newest fine dining attractions in the Windy City, BLVD draws inspiration from Hollywood’s Sunset Boulevard circa 1950, when Sunset was an iconic strip of dining and entertainment establishments. Located in Chicago’s West Loop neighbourhood, BLVD combines old Hollywood-style glamour, luxury, and decadence with contemporary cuisine, cocktails, and background music that sets just the right atmosphere. Citing its snug booths, curved staircase, huge mirrors, and countless chandeliers, Zagat declared it one of Chicago’s sexiest new restaurants. To manage the system, the Encompass AV team chose the Symetrix Prism 8×8 DSP, which provides 128 Dante channels (64×64), enabling reliable audio networking over IP. For BLVD’s system, the Encompass AV team added a Symetrix xOut 4 Dante-enabled analogue output expander, giving the 1U rack-mount Prism 8×8 a total of 12 analogue outputs. An Attero Tech unD610-BT Dante-networked audio wall plate connects to the Prism DSP to give the BLVD staff convenient stereo analogue input and output, as well as stereo Bluetooth audio input.